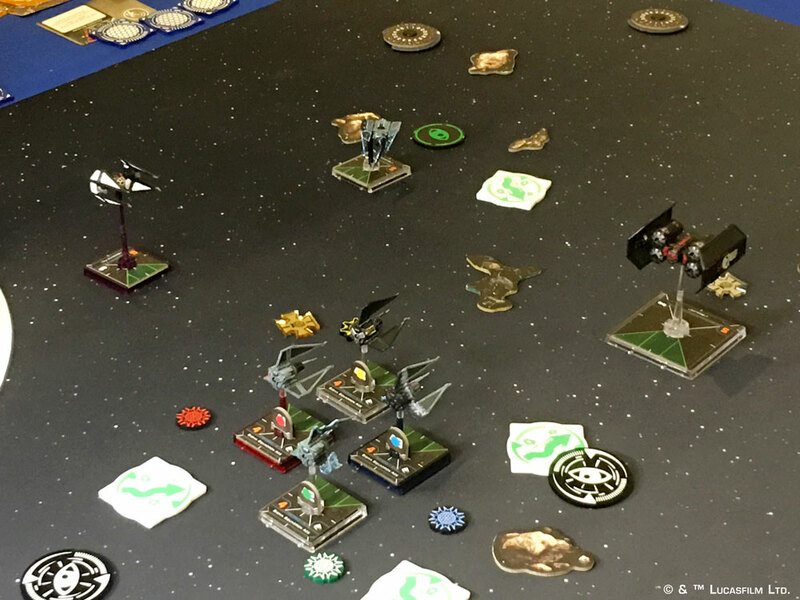 This past weekend, hundreds of excited X-Wing™ fans made their way to Glendale, Arizona, to take place in the first System Open Series event of 2019—which just so happened to be the last major X-Wing event taking place before the first wholesale points adjustment. For many, this meant taking advantage of the Galactic Empire's aggressively priced TIE/ca Punishers for one last tournament—or playing with Scum aces like Boba Fett and Palob Godalhi in the Moldy Crow before they, too, saw their anticipated squad point increases. 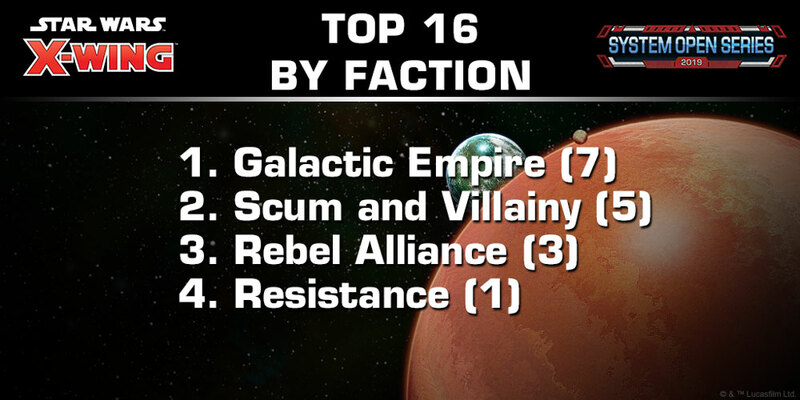 As a result, the Galactic Empire and Scum and Villainy factions were well-represented. Among the 24 players who qualified for Day 2 by winning five or more games on Day 1, nine of them were flying for the Galactic Empire. The Scum were next, flown by seven players. At the end of the tournament, however, there could be only one winner, and that was Philip Booth, whose squadron partnered three of the Empire's most consistent aces: Soontir Fel, "Whisper," and "Redline." With its high initiative values, ordnance, and agility, Philip's squadron had enough firepower to overcome all challengers—a dramatic and fitting send-off for a squadron that was recently struck down by the squad points adjustments. Interestingly, though, the runner-up squadron remained nearly untouched by the January 28 points cost update. Flown all the way to the final table by Ryan Farmer, and also flown into the Top 4 by Dominick DiCarlo, the Imperial squadron of four Sigma Squadron Aces, each equipped with Juke, proved powerful enough to defeat nearly all the event's ordnance lists, Scum tricks, Rebel heroes, and even the Resistance's finest—faltering only against Philip's champion squadron. What Will a New Meta Mean for the Sigma Squadron Aces? Toward the end of 2018 and through the first weeks of 2019—up through the System Open in Glendale—we saw the battles for initiative lead to some deep bidding wars. Of the Top 8 squadrons, only the Sigma Squadron Aces and Emmanuel Gambliel's Rebels bought their full 200 points of ships and upgrades. The others all bid multiple points for the initiative, with two of the squads weighing in at only 193 squad points. But with the recent changes to the point costs for such powerful, initiative-based upgrades as Supernatural Reflexes and Primed Thrusters, many of the lists that sought to use these tools for positional advantages may have to rethink their options, and skillful players may be able to better line up their shots against higher initiative ships, even if they're not running high-initiative ships themselves. Does this mean the Sigma Squadron Aces—with their initiative values of four—are a signal of things to come? Or are we going to find these aces forced out from their perch atop the metagame by squadrons that focus on defenses apart from arc-dodging? We know, for instance, that the recent points costs should bring large-base ships back into the metagame, even though there was only large-base ship in the Top 12 lists at Glendale. Perhaps the largest question coming out of the Glendale System Open and points cost update was whether or not the First Order will rise to meet the other factions on a more level playing field. 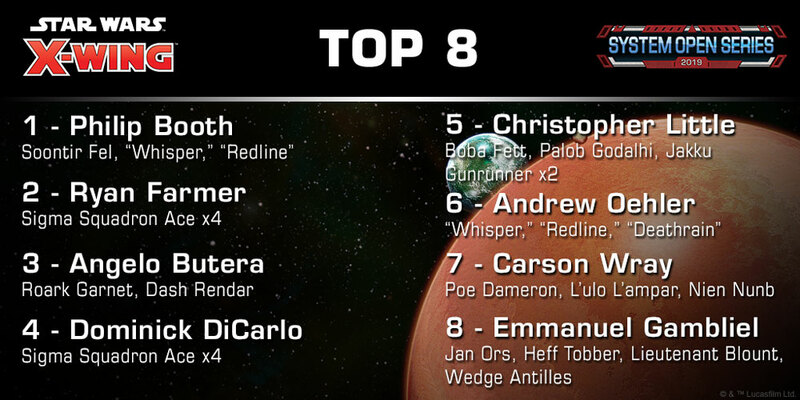 While Hart Shafer was able to reach Day 2 with a daring squadron of three Upsilon-class Command Shuttles, he was the only First Order squadron leader to make the cut and was promptly eliminated just before the Top 16. Still, the battles at Glendale showed a great deal of variety among the top X-Wing squadrons, and that variety's only going to increase as the First Order gets a boost, several of the underpriced ships are brought back into balance, and the developers use the X-Wing Squad Builder app to keep transforming your games—and the System Open Series—into a thrilling series of starfighter battles! Philip Booth and Ryan Farmer maneuver into firing range during the final match of the Glendale System Open. 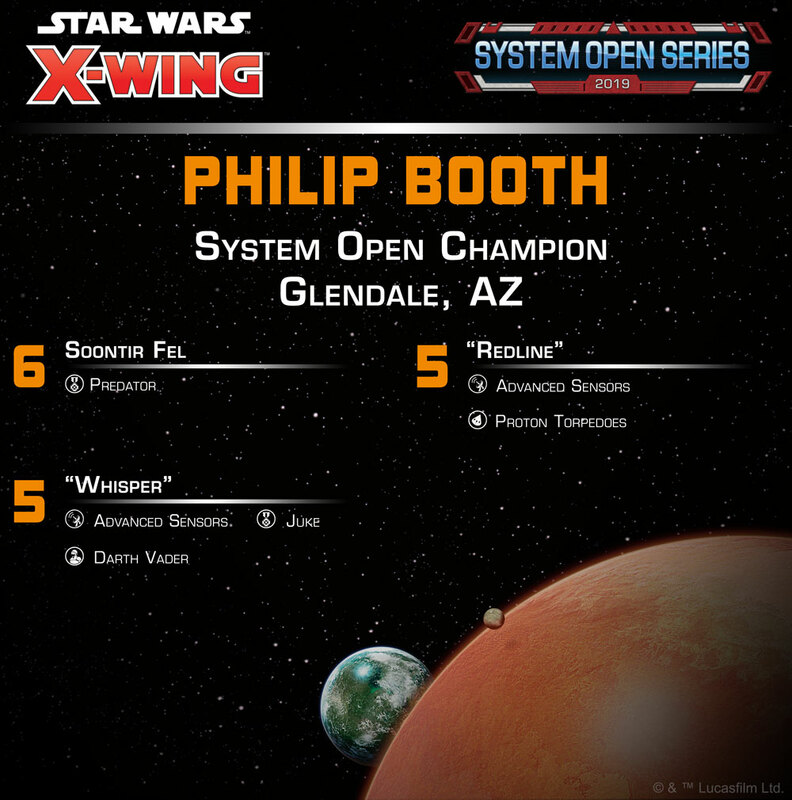 Congratulations to System Open Champion Philip Booth, and to Ryan Farmer, Angelo Butera, Dominick DiCarlo, Christopher Little, Andrew Oehler, Carson Wray, and Emmanuel Gambliel, who all earned their invitations to the 2019 X-Wing World Championships with their Top 8 finishes. 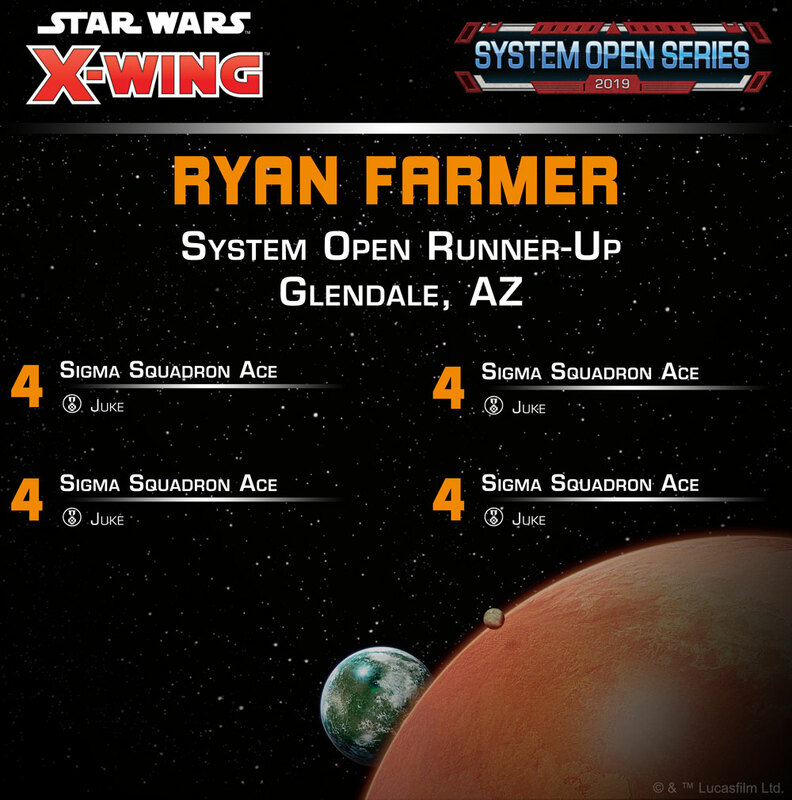 Congratulations also to Ryan Frost and Drew Brody, who went undefeated in the Hyperspace Qualifier to earn their invitations to the 2019 X-Wing World Championships—and for showing that the First Order had more in store for its opponents than the System Open Series main event may have suggested. Where will you join us for the unmatched starfighter battles of the X-Wing System Open Series? You can find our list of scheduled events posted on the System Open website. And even if you'll have to wait several months for your chance to participate, you can look for us to recap event highlights on our website, and you can stay informed of all the latest System Open Series news by following us on Facebook and Twitter @FFGOP!